For all around wildlife and scenery, a visit to the sub antarctic island of South Georgia is incomparable. 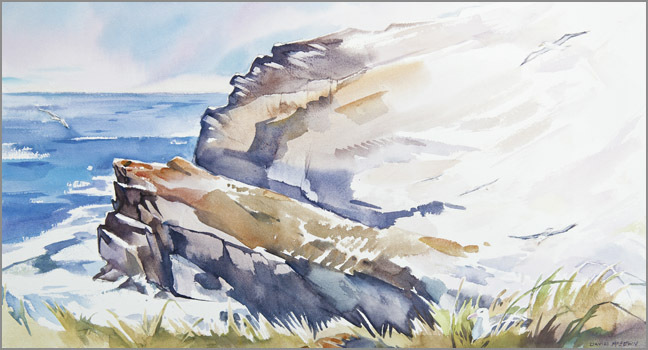 The video above captures some of the painting highlights and wildlife encounters from a recent trip in late 2011. Imagine being dropped off at a beach to paint and be surrounded by more than 200,000 King Penguins, this is truly an exciting problem to have! After taking some photo and video reference I find a place to sit without obstructing the wildlife highways and be still to observe the cycle of life displayed within meters. On one landing a real highlight was when an elephant seal pup came out of the surf and decided to curl up underneath my easel thus slowly nudge me off my chair. With only a few hours ashore before heading back to the ship, the main landscape contours and mood is recorded in wash as well as inspiring groupings of wildlife interaction rendered. These on location works are really useful as reference for future studio paintings as photos can come with unnecessary details. We really look forward to go back to South Georgia and Antarctica next season!